Moto E4 Plus is launched by Motorola with exciting specifications. Motorola’s E4 Plus smartphone is priced Rs.9999 in the India market with most worth specs and features. Users can but Moto E4 Plus Flipkart. The device is exclusively available on Flipkart online shopping portal. 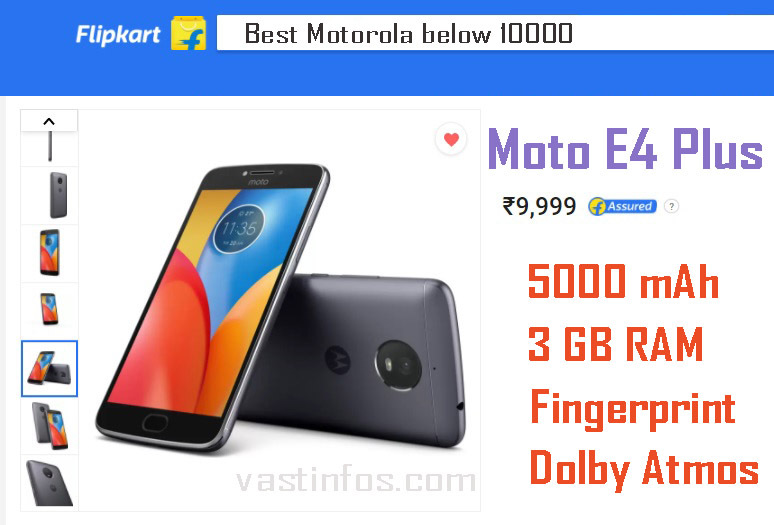 Users can but Moto E4 Plus Flipkart from July 12th midnight with exciting launch day offers. Moto E4 Plus offers a very good range of specifications for the price of Rs.9999. One of the best specification is a high capacity battery of 5000mAh. This provides far better battery backup. It also comes fast charging technology. Also, this is the highest every battery backup powered Motorola smartphone. Hence its a good choice for the Moto lovers who are waiting for a better battery backup Moto smartphone. Another specification is the device comes with a fingerprint sensor. While the Moto C Plus lacked in the list of sensors, the Moto E plus comes with far better sensors. Sensors of the E plus are Fingerprint, Accelerometer, Ambient Light, Proximity Sensor. Moto E plus is loaded with the latest Android OS version Android Nougat 7.1.1. E plus comes with good internal storage space of 32GB and powered by 3 GB RAM. Also, the device has expandable up to 128 GB. Another feature of Moto E plus is the device has Dolby Atmos sound system. Operating system: Android Nougat 7.1.1.